It is July and I decided to check out the style resolutions that I made back in January for 2014. Resolution #2 was a significant change since I have carried an oversized bag for most of my career as well as in my social life. You see, even when I'm not carrying my work with me, I'm diabetic and I always have what I need and more to accommodate any situation. The 2014 resolution read: "Carry a smaller bag. . . . Holts (Holt Renfrew) suggests this orange cross body Rebecca Minkoff bag. 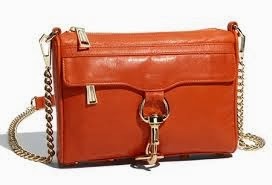 I probably won't do a rusty orange but this particular bag comes in a variety of colours in addition to the basics." (from 2014 Style Resolutions) I did in fact buy a Rebecca Minkoff bag. New: I happened to be in Calgary in April and found a Rebecca Minkoff bag, in off-white with a black trim, that would take me through the summer. However, now that I have my smaller sized cross body bag, I find that I seldom carry it. Of course, the problem is - it's too small. I suppose I partially fulfilled Resolution #2. Did you make any 2014 style resolutions and did you fulfill them? I can definitely see some rust or orangey tones in that first picture but it also looks kinda "tannish" in colour. I LOVE the colour of the off-white. I has very nice lines with the stitching and the fold over flap. Both are very nice. As for 2014 resolutions... Have fun everyday. So far so good! It's the teacher in me, what can I say? Thank you for the reminder to "have fun everyday"! I'll try.